Learn more about My Pool Pal's Flotation Swimwear for infants and toddlers. Learn more about Aqua Force, Coastguard approved swimwear for toddlers. Learn more about Swim-sters for infants and toddlers. My Pool Pal's original resuable and disposable swim diapers. Learn more about UP360. Our new brand for youth and adults with Special Needs. Learn more about Sun Protection by My Pool Pal and UP360. 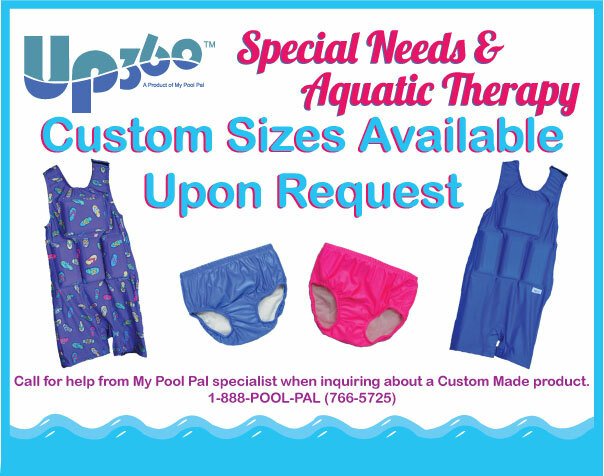 Call for Custom Sized My Pool Pal or UP360 flotation swimsuits and swim diapers.